Maggie Reynolds needs a place to hide. Drake's Retreat is the perfect solution. Nestled deep in the backcountry of the Sierra Nevada Mountains, Drake Strong's couple's retreat is the ideal location for Maggie to regain control of her shattered life. But, convincing the intimidating resort owner to allow her to attend the retreat, without a partner, is the first of many obstacles she must overcome in the heart of the wilderness. Drake Strong's responsibility to his guests includes keeping them safe from the dangers they may encounter at his retreat. When Maggie shows up alone and unprepared for his remote resort, his responsibility to her becomes much more personal than he had ever intended. Maggie Reynolds cast a glance at the curious faces watching her. She had definitely caught everyone’s attention. Heat climbed up her cheeks, and it had nothing to do with the unusually warm, early September day. She ignored the resort’s other guests and kept her attention on the man standing in front of her. The broad-shouldered lumberjack of a man stared at her in silence. He ran his deep blue gaze over her, as if searching for what was wrong with her. Maggie studied the owner of the resort, searching for a glimpse of compassion. His too long, dark hair did nothing to hide the irritation hardening his rugged features. He stood with muscled arms crossed and booted feet wide apart. She detected no more compassion in him than she did in the bark of the tree rooted behind him. “Mr. Strong, I won’t be any trouble. I need to be here.” She tried to keep the desperation out of her voice. Maggie yanked her hand out of his rough, warm grasp. “You’re mistaking me for someone who would care. I’m not leaving.” She crossed her arms and tapped her right foot, ignoring the lingering warmth where he had briefly touched her. “Suit yourself. But you have to follow the rules. No one goes off alone. No hiking, caving or any kind of exploring by yourself. Not anywhere. If you want to be a tag along…” He gave an exasperated shrug. She took his answer as affirmative, and nodded. “Fine.” She plopped herself onto the log bench next to the other guests as they waited to be transported to the cabins, and shoved her hair back from her face. 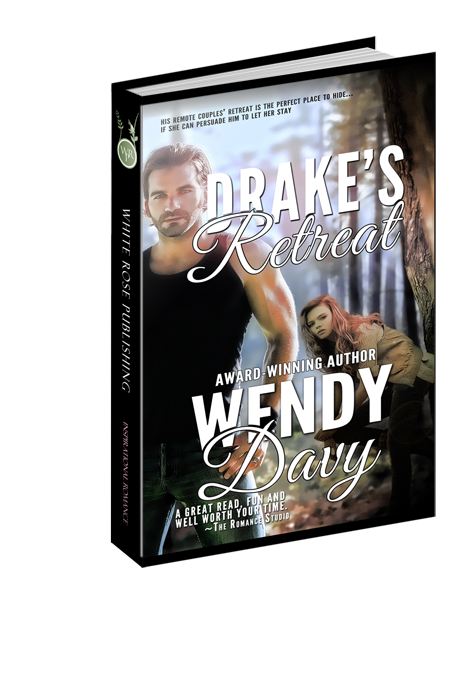 She avoided eye contact with Mr. Strong as she flipped open the brochure for Drake’s Retreat, but her skin tingled where his penetrating gaze remained focused on her. She tried to look at ease, but her heart still beat at a frantic pace. Would he change his mind and send her away? Finally, the man turned and walked away. She let out a pent up breath and her shoulders sagged in relief. She’d done it. Now, she would have a chance to start picking up the pieces of her shattered life and figure out how to paste them back together again. Maggie scanned the resort’s brochure, where she had won the right to spend the next two weeks. She read the first line three times before giving up. Her mind couldn’t focus enough to allow the words to make sense. A light tap on her shoulder made Maggie jump. She turned to find the youngest member of the group smiling at her. “It’s a long story.” Maggie shrugged, as if the pain wasn’t fresh and raw. “Well, whatever happened, remember there’s a reason for everything. Maybe you’ll be better off anyhow. Look at Mr. Hunk. He’s watching you.” Cyndi looked past Maggie’s shoulder. “Why on earth not?” Cyndi gave her an incredulous you’re-out-of-your-mind stare. “Aren’t you supposed to be a newlywed?” Maggie narrowed her eyes. Maggie laughed, which helped release some built up tension. Maggie cast a quick glance over her shoulder. His broad shoulders bunched as he hauled luggage to a long, narrow dock jutting out from the shoreline. She looked past him to the lake that lay beyond and wondered why he was moving the guest’s luggage onto the dock. She turned back to Cyndi. “The brochure says the rockers on the porches are handmade. Maybe he carved them out of a tree.” Maggie intended her comment as a joke, but just from the looks of him, she imagined him capable of a lot of things. A lanky young man walked over and straddled the bench next to Cyndi and wrapped affectionate arms around her. A fuzzy growth of beard lined his angled jaw and his long hair hung down his back in a ponytail. He directed his warm expression to his new wife. “Dillon, this is Maggie.” Cyndi leaned in, and snuggled with her husband. He took a brief look at Maggie and nodded. “Nice to meet you.” He turned his attention straight back to Cyndi. Cyndi cuddled with her new groom as if Maggie had ceased to exist. Amused, Maggie turned around with a hint of a smile and a shake of her head. A slight wisp of a breeze carried a wavy strand of hair across her eyes and she absently reached up to tuck it behind her ear. Her brief smile faded as thoughts of Nathan invaded her. He had never liked to show affection in public, or anywhere else for that matter. A stab of pain struck her. What would it be like to be head over heels in love like Cyndi and Dillon? Maggie chewed on her bottom lip. She didn’t know the answer, and yet she was supposed to have gotten married yesterday. Determined to put Nathan out of her thoughts, she opened up the resort’s brochure again and reviewed the pages. Maggie recalled from a previous brief look at the information that Drake Strong owned a large portion of wilderness which backed up to the Sierra Nevada National Forest. The pictures showed a quaint, yet rustic setting on a clear blue lake that drew her into daydreams of rest and tranquility. Maggie flipped the brochure to the back and her breath caught in her throat—a list of must have equipment printed in bold-red lined the page. How could she have missed it before? She didn’t have one thing on the list. No mosquito repellant, hiking boots, long underwear or gloves. Even a handheld GPS system made the list. As if she would know how to use one of those gadgets anyway. She suddenly felt ill-prepared as she swatted at a mosquito. Too late; it had bitten her. She felt the annoying itch already. Maggie sneaked a peek at the other guest’s feet. She felt even more unprepared when she discovered they all wore hiking boots. Cyndi and her new husband had them, a couple in their early fifties had them. Even the last couple in the group had them. They looked too old to hike, but they still had hiking boots. A tinge of embarrassment hit her as she looked down at her meek tennis shoes. Were they adequate for the rough terrain? She wished she’d had more time to prepare. As she studied the soles looking for answers, a tall shadow closed in over her. Maggie’s gaze slowly trailed up to a pair of well-worn boots resting in front of her. Then her gaze traveled further up to a pair of well-worn jeans. Finally, she met the well-worn eyes of Drake Strong. His blue eyes reminded her of the deep sea, turbulent and unforgiving. Maggie guessed him to be in his early thirties, but his eyes held the secrets of a much more experienced man. “Wondering if those shoes are adequate?” He directed his low voice to her alone. “For around camp they are, but not for hiking or caving. Since you’ll be going to the resort without a partner, you won’t be allowed to remain behind if everyone else chooses to go on an excursion. So, I would suggest you buy some new hiking boots at Jenkins Store. He’ll have what you need.” He pointed to one of the many quaint village stores lining the lake. He gave her another quick perusal and sent her a doubtful look before he turned on his heel and strode to the front of the group. Maggie wanted to stick her tongue out at him but decided she better not. She’d behave for now and save her opinions for later. He still might refuse to let her join them if she deliberately provoked him. “Good afternoon and welcome everyone. I’m Drake Strong, owner and operator of Drake’s Retreat. Is everyone ready for an adventure?” He smiled as the guests seemed eager to hear more. Maggie sucked in a breath when his lips turned upward. Drake Strong was a handsome man even with a scowl on his face, but when he smiled, he transformed into nothing short of gorgeous. She couldn’t blame Cyndi for noticing. Maggie tore her gaze off the charming dimple on his cheek and concentrated on his next words. Each of the guests introduced themselves. All together, seven guests waited to go to Drake Strong’s all inclusive resort. The first couple to speak up, Beverly and Stephen Riley, looked to be in their early fifties. Beverly wore tailored slacks and a matching cardigan with layers of jewelry. She sat with a stiff back and held her head high as she spoke her name in a rigid monotone. Beverly’s husband stood tall, ran a hand over his thick, gel-coated hair and adjusted his neck tie. He gave his name to the group then bent slightly at the waist. “Oh, sit down. You don’t need to impress anyone here,” his wife snapped. “Speak for yourself, Bev.” Stephen turned to Maggie and winked, earning his wife’s elbow in his gut. Maggie averted her gaze as unease settled in. The older couple, Annie and Larry Remmings, sat cuddled close to each other with bright smiles on their aging faces. Annie announced the fact that they were also newlyweds. Cyndi and Dillon Marcus introduced themselves next. They untangled themselves from each other long enough to tell their names. Maggie tried to commit each of the names to memory. If she didn’t make a conscious effort to remember names, she’d forget as soon as the person spoke them. “Miss Reynolds. Care to introduce yourself?” Drake Strong prompted. Great. Now that she had been interrupted, she would forget everyone’s names and embarrass herself later. Mr. Strong began to progress from mildly annoying to downright irritating. She drew her gaze from the resort owner as each of the guests stared at her expectantly. Her remark earned giggles from behind her. “Seems we have a dare-devil in our midst.” Cyndi piped up. Laughter erupted from the guests, and Maggie couldn’t help but join in. “I’ve been exposed to far more intimidating circumstances, Mr. Strong. I’m sure I can handle anything you have to offer.” Maggie defended herself with much more confidence in her voice than she felt. Even though the thought of gliding down a mountain on a cable, high above the ground, made her queasy, she refused to admit it. She remained undecided about crawling around in a dark, dusty cave. She’d have to try it in order to know how she felt about that one. She appreciated his attempt at civility, even if it did come a bit late. Her irritation eased, if only slightly. “Drake.” She inclined her head in acceptance. “Oh, dear. You make it sound so dangerous.” The white-haired, older woman spoke up. Her aged hand clasped around her husband’s arm. Maggie tried to recall the woman’s name, and her irritation resumed, as she blamed Drake for not being able to remember. Maggie stored away Annie’s name. Three down, three to go. She looked at Annie’s husband. Was his name Gary? Harold? It could be Ichabod as far as she knew. She drew a complete blank. Maybe Annie or one of the other guests would mention his name again later. Maggie studied the woman who wore loads of jewelry and a sour expression. Then she looked at the woman’s spouse who wore the shiny hair-gel, and who fidgeted in his seat. Maggie wracked her brain, trying to remember their names. The rumble of an airplane caught her attention. An itty-bitty plane barely skimmed the tree tops before bouncing and landing unceremoniously on the lake. The seaplane jostled and coughed as it made its way to the long dock. As the engine wheezed out and the pilot erupted from the plane, Drake gave a wave to the small, wiry man. Maggie forgot her mission to remember names as her stomach dropped to her toes. She swallowed hard as she looked at the tiny seaplane. Drake looked at Maggie. “You’ll have time to get your boots.” He handed out the papers for each person to sign before they departed on their journey. The guests dispersed, and began to ready themselves for the trip, but Maggie kept her gaze trained on Drake. “Read the fine print.” He pointed to a small disclaimer at the bottom. Maggie read it aloud. “Asterisk. Due to unforeseen difficulties, the mode of transportation may vary.” She looked up at him with wide eyes. “No second thoughts.” She held her chin high. “See you in a few hours then.” He walked away, leaving Maggie to stare at his retreating back. “Why what?” Drake stopped walking but didn’t turn around. His head dropped down and a sigh heaved his shoulders. “Why can’t we take the truck?” She came up alongside him. “Oh.” Her hope deflated. How could she argue with that? “Now, if you’ll excuse me. I need to help Annie and Larry into the plane.” Drake left her staring after him. Larry. Maggie stored away another name for future reference. Annie and Larry actually looked happy as they climbed into the plane. Was she the only one going on this retreat who didn’t have a death wish? She shook her head and prayed she would survive her vacation.